Disclaimer: This post is sponsored by OXO Good Grips and their line of over 800 award winning cooking tools and houseware products. 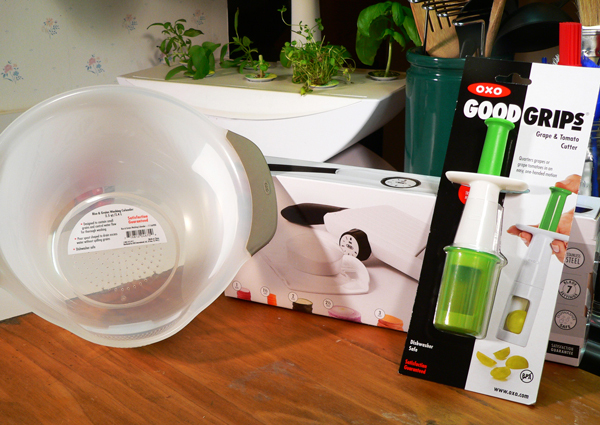 OXO provided me with three of their products for testing in exchange for my honest review of the items used. I was not compensated financially for this post, and all comments and opinions expressed are totally my own. I’m always excited when the fine folks over at OXO invite me to test and review their products. Several of the recipes posted here on Taste of Southern have been created in conjunction with OXO and I invite you to check those out as well. This time, OXO suggested a recipe featuring the current craze of food “bowls.” You’ll find many such recipes here on the Internet, and when OXO offered to send me several of their products to test out with a bowl recipe, I quickly asked to join the fun. Now, I must admit that I haven’t actually jumped on the bandwagon with all the latest food bowls, but I have often made a couple of similar type things for my breakfast meals. I knew right away what I would prepare. Breakfast is usually pretty simple around Taste of Southern. I’ll often fix up some grits and top that with a couple of hard boiled eggs in a bowl. I call that my “King’s Breakfast.” It’s a long story that I’ll save for later, but let’s just say it goes back to some tough financial times when I thought eating a couple of eggs and a bowl of grits was eating like a King. It’s the same with this rice bowl. Rice was often a main ingredient during those times because it could stretch a simple meal out into something more hearty. Besides, rice is so versatile. Right? I’ve remained extremely thankful for God bringing me through some kind of tough days, and it helps me to always remember just how blessed I truly am. I can eat boiled eggs and grits for breakfast any day. So, if you’re ready to check out our breakfast bowl, and ready to see some great new kitchen items from OXO, then let’s get in the kitchen… and Let’s Get Cooking. 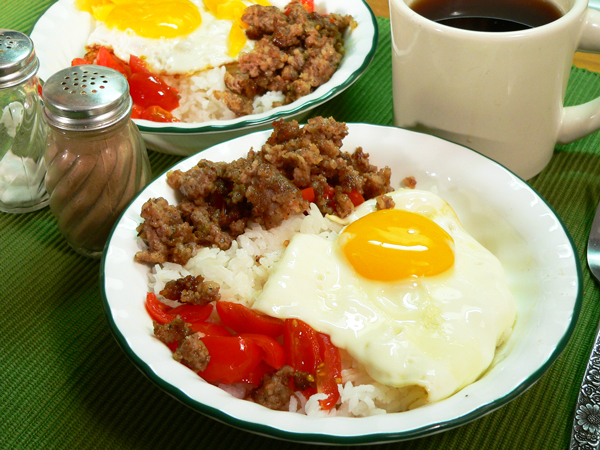 Sausage, Egg and Cheese, Rice Bowl recipe. You’ll need these ingredients. 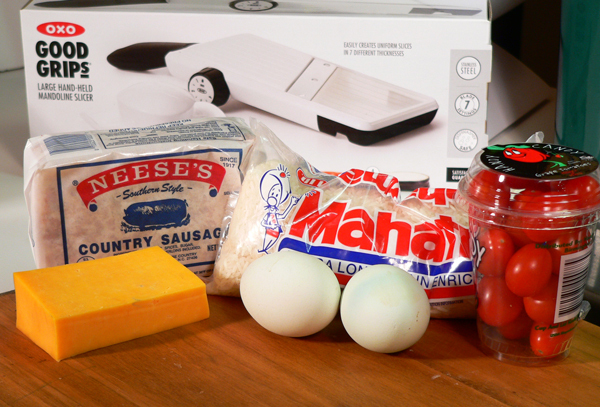 These are the OXO brand tools used in this recipe. You can click the links below to learn more about them on the OXO website. Start by rinsing the rice. You do rinse your rice first don’t you? I felt this was the perfect opportunity to also test out another way of cooking rice. I don’t normally rinse my rice prior to cooking, and have always used the pretty basic method of preparing rice on the stove top. You know, the directions on the back of the bag or box. This time, I’m going to boil the rice in a large amount of water, just to see if it keeps it from being so sticky as rice often turns out to be. Will it be different? Let’s see. The new OXO Rice and Grains Washing Colander was perfect for this. Unlike your typical colander with large holes, the OXO Grain Washing Colander has much smaller “square” holes. It’s perfect for rinsing grains, pasta, rice, anything small that normally slips through those larger holes on your old kitchen colander. Just rinse the rice well under cold running water. Here’s a closer look at the drain holes in the pouring spout area of the colander. Just tilt the colander and drain the rice. No more holding your hand over the rice trying to keep it out of the sink. See the spout area down in the bottom left corner of this photo? I also liked the grips on the handles of the colander as well. But, what was really cool was that the bottom of the colander has a raised ridge bottom. It may not work out for everyone, but this ridge slipped right down inside the drain of my garbage disposal which kept the colander firmly seated while I rinsed the rice. After rinsing the rice really well, I let all the water drain off. Then, I placed the fully rinsed rice in another bowl, and covered the rice with lots of clean cool water. Set this aside, and just let the rice SOAK for 30 minutes. This step is suppose to allow the rice plenty of room to swell as it absorbs water and will hopefully make for larger, fluffier grains of rice. After 30 minutes soaking, pour the rice back through your colander. You still can’t actually see it, but that rim around the bottom of the colander is sitting down inside my drain. Look real close at the bottom to see it. To cook the rice: Fill a large sauce pot about half full of cool water. You want to have plenty of water to boil the rice as it cooks. I know this is a bit more work than the regular old way of cooking rice, but let’s see if it works. NOTE: I added one teaspoon of salt while making the rice. After it cooked, I could hardly taste any of the salt flavor in the rice… which I like. 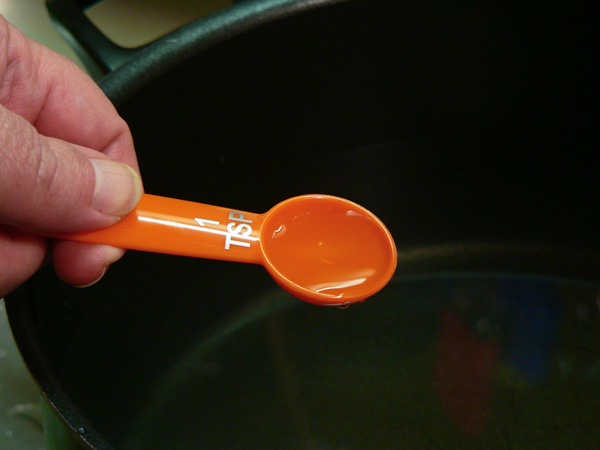 In the printable recipe, I’ve adjusted this to say ONE TABLESPOON. I think you’ll like that better. 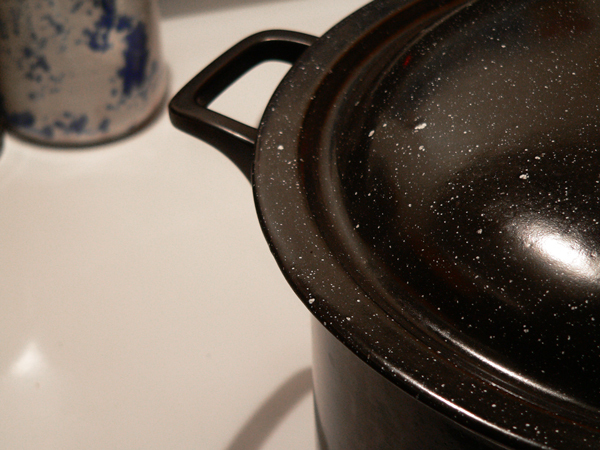 The rice will absorb some of the salt while it cooks, but not all of it. We’ll be draining it again before we serve it. Rice needs some salt for flavor in my personal opinion. You just can’t ever get it to taste right for me if you have to try and add more later. Don’t hold that against me… okay? 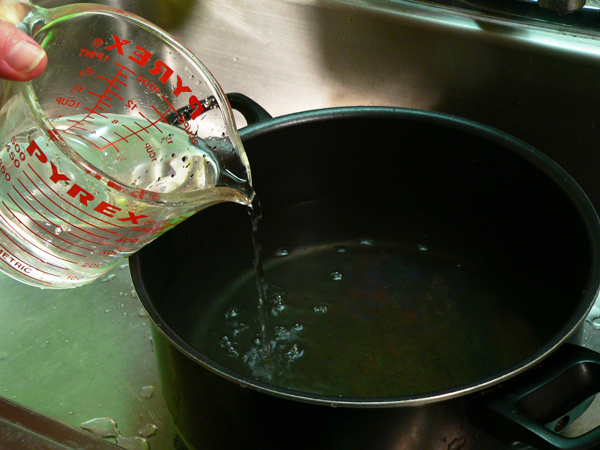 Vinegar is suppose to also help rinse the starch from the rice as it cooks which in turn helps keep the rice from sticking together as it cools. It’s also said it will help keep the grains from breaking. 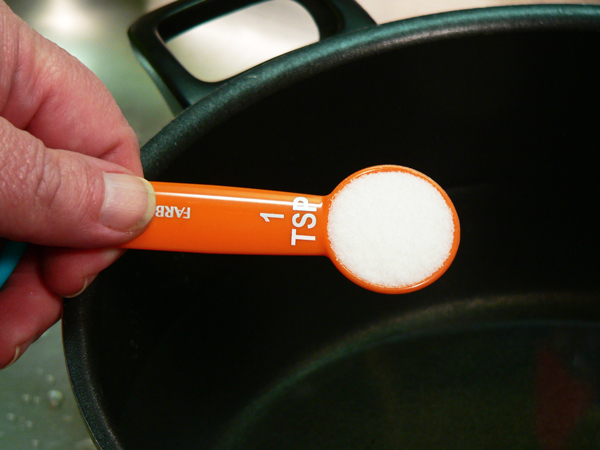 Give this a slight stir and place the pot on your stove top with the heat set to Medium-High. 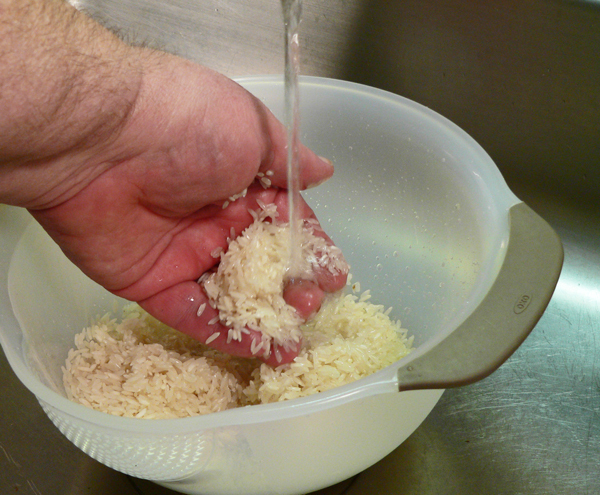 Just as soon as you start to see some bubbles begin appearing in the water as it heats, add the drained rice. Cover the pot and let the water return to a boil. The rice needs to boil for about 8-10 minutes when preparing it this way. You’ll need to stir it about every 3 minutes during that time. As you can see, there is plenty of water in the pot to fully cover the rice. That’s the purpose of preparing the rice in this manner. We’re going to boil it, but not until all of the water evaporates out of the pot like in the recipe on the back of the bag or box. This method is suppose to eliminate any chance of your rice sticking to the bottom of the pot, and all the water allows the rice to “swim free” and expand to it’s fullest. Again, making for fuller and fluffier grains of rice. Test a few grains of rice to be sure it’s almost done. You’ll want to remove it from the heat while it still has just a bit of a “bite” when you bite into it. It will continue to cook once it’s removed from heat. 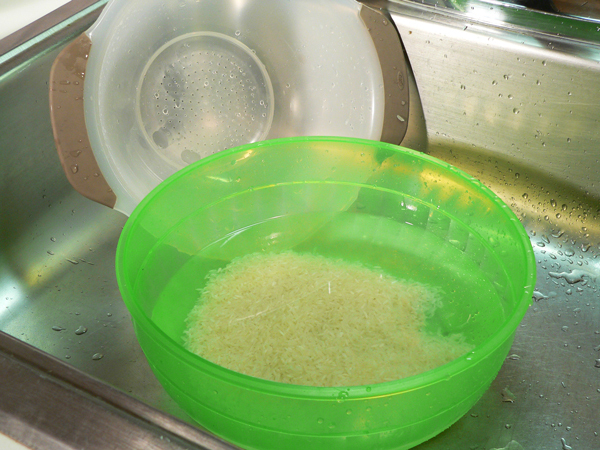 Use your OXO Rice and Grains Washer once again to drain the cooked rice. Pour it into the colander and let all the hot water drain off into your sink. Just set the rice aside until you’re ready to use it. Cooked rice is best when served right away. If you intend to let it cool and refrigerate it, add a little oil or butter and give it a good stir before it cools down. I always like to add a little butter to my rice after cooking, but didn’t this time. The rice turned out pretty good cooked this way. There was no worry about it sticking to the bottom of the pot, and it did indeed turn out to be light and fluffy. I was well pleased with the cooking method. I was however disappointed that it didn’t have enough salt in it for my taste. Guess I should have stirred in a pat of butter after all. Again, I’ve adjusted the printed recipe to add more salt into the water while boiling the rice. Always use your own judgement based on your personal tastes and sodium restrictions or needs. 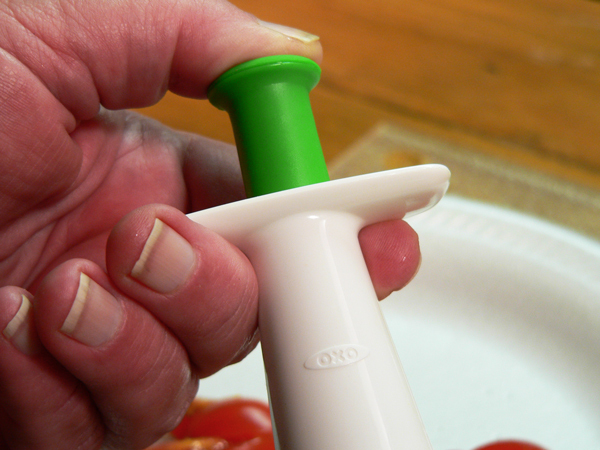 OXO Good Grips Grape and Tomato Cutter in action. It’s time to start assembling our breakfast bowl. This part was super easy with this little gadget. 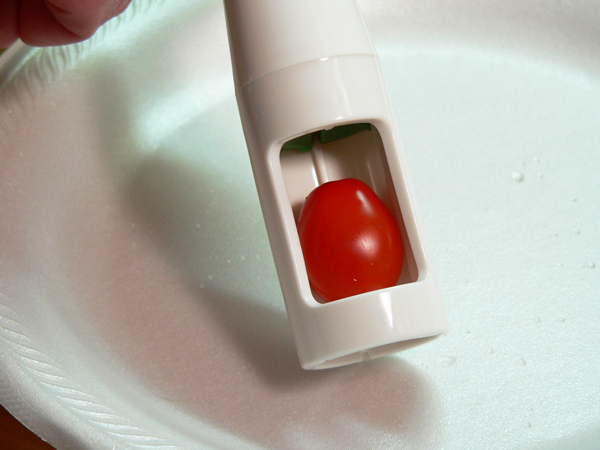 You insert a grape tomato into the well of the cutter first. Watch the quartered tomatoes pop out the bottom. How cool is that? 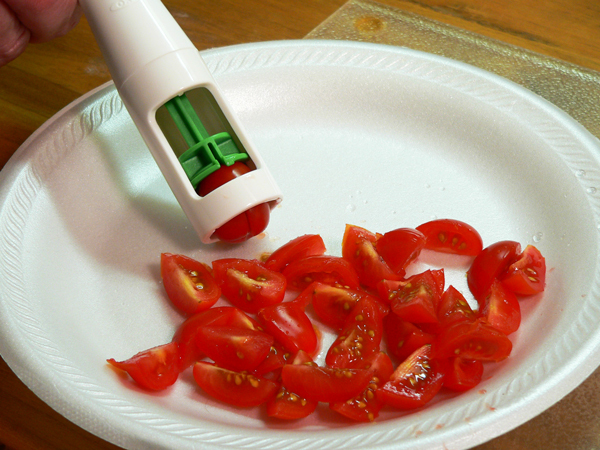 The plunger pushes the tomatoes through the cutting blades that are in a fixed position in the bottom of the unit. In just a couple of seconds, I had quartered about 10 of these little grape tomatoes for the recipe. I really hadn’t expected much from this little tool, but the only slow thing about it was me loading more tomatoes into the bottom. As fast as I could load it and squeeze the plunger, the nicely sliced and quartered tomatoes popped out the bottom. This would be perfect to quarter grapes, grape tomatoes, even pitted olives in one easy motion. It would be great for chicken salad, or regular salads. Just think of all the uses for it. 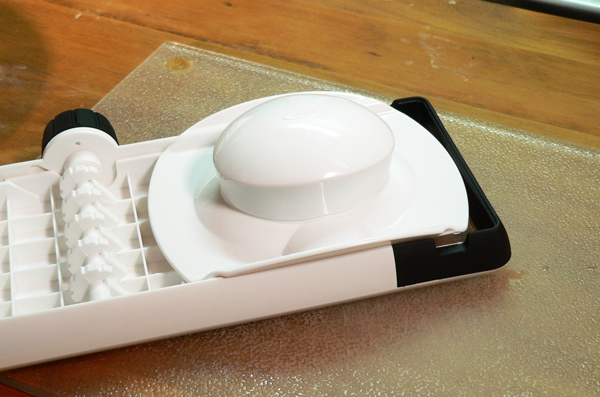 The unit twists apart for cleaning, and it’s dishwasher safe. It even has a cover that snaps on over the chamber for safe storage and to protect the serrated cutting blades. 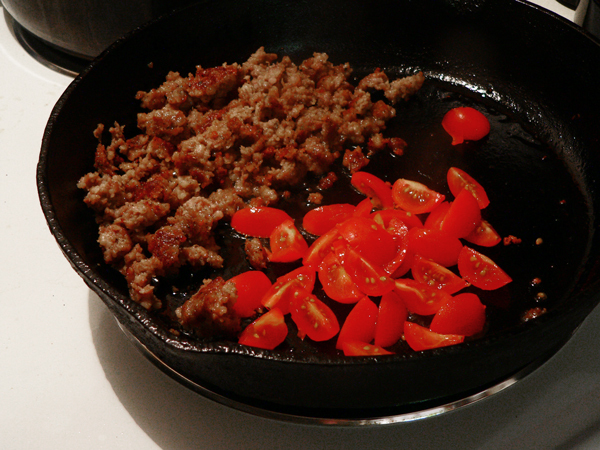 Next, toss the ground sausage into your favorite skillet and brown it. You know me, I’m using mama’s old cast iron skillet for this. Once the sausage was done, I just tossed in the quartered tomatoes for a minute or so. I wanted them to just heat up a bit and not fully cook. The last tool that OXO provided was this Large Hand-held Mandoline Slicer. I must admit, I’ve always been a little intimidated by these type of slicers. I’ve owned one or two in the past, and I’ve read the horror stories that can happen if you use one improperly. PROPER USE MEANS JUST THIS: USE THE FOOD HOLDER WHEN WORKING WITH IT. Follow the proper directions for using your Mandoline Slicer, and you’ll be good. As you can see, this unit has a dial adjustment on the side of the slicer. This will allow you to select the thickness of the slice you prefer. You’ve got 7 choices to select from. You can hold the slicer on a cutting board and let the slices fall to the board, or you can place the slicer on top of a bowl and use the non slip notches on the bottom to let the slices fall directly into a bowl. This Roma Tomato was pretty ripe, but the Hand-held Mandoline Slicer stainless steel blades sliced it smoothly and evenly for the most part, even on one of the thinner settings. The nice part is that the unit is wide enough to accept a variety of fruits and vegetables. Clean up is simple, just be careful around the fixed cutting blade. It’s also dishwasher safe. The food saver “cap” attaches to the bottom of the unit for easy storage. Always use this piece anytime you’re slicing vegetables on your mandoline slicer. 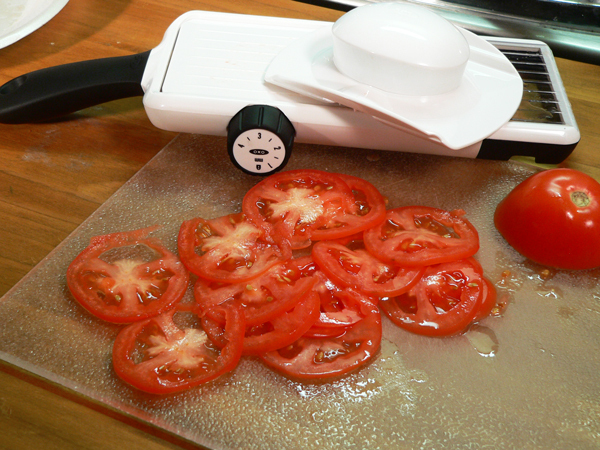 It was made to protect those fingers while making quick, even slices of many types of veggies. This will come in real handy when it’s time to slice up cucumbers for making pickles. Oh yeah! 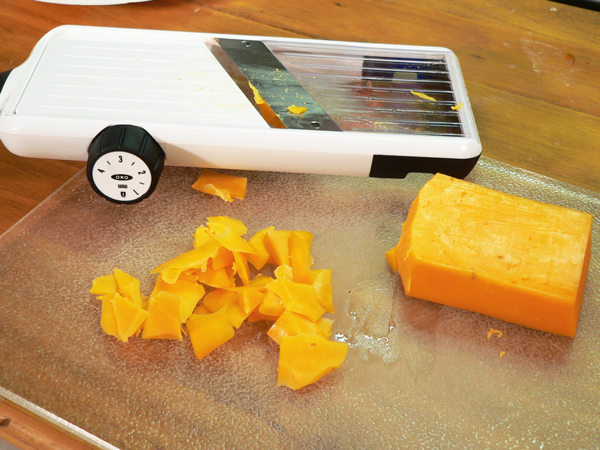 I can’t recommend using your slicer this way, but I used it to slice off some pieces of this leftover hunk of hoop cheese. I didn’t need a lot, but it worked. To assemble the bowl, place a cup or so of rice in a small bowl. Add the cooked sausage and the warmed tomatoes. Top this with an egg cooked to your liking. I personally think leaving the yolk a little “runny” is best. That way, you can break the yolk and stir it into the rice. Yum… good! Top it with some cheese and you’ve got a really quick and easy breakfast bowl. Of course, if you’re like me, you might like it for supper as well. I often have a breakfast dish for a late meal. How about you? 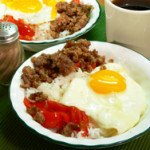 While I cooked rice just for this recipe, I typically make a breakfast bowl from leftover rice that has been hanging around in the fridge for a day or two. It’s a great way to use up leftovers. Add anything else you might like and have on hand. Make it your own and let me know what you create. Special thanks to our friends over at OXO for trusting my opinions of their products. They have no idea how I’ll report on them when they make they offer. But, they know they have great products, so I doubt that really have any need to worry. My collection of OXO Good Grip tools is growing. Here’s to hoping we can work together again. And, here are the links to all the products that we tested. Check them out on the OXO website. I highly recommend them all and really enjoy how well built they are, and how they always work as OXO states they will. These are my personal thoughts and comments on them, and I’m sticking to them. I hope you’ll build your own breakfast bowl real soon. I look forward to hearing about it in the Comments section below. These instructions are for boiling rice in conjunction with the OXO strainer. Rice may also be cooked following directions on package if desired. 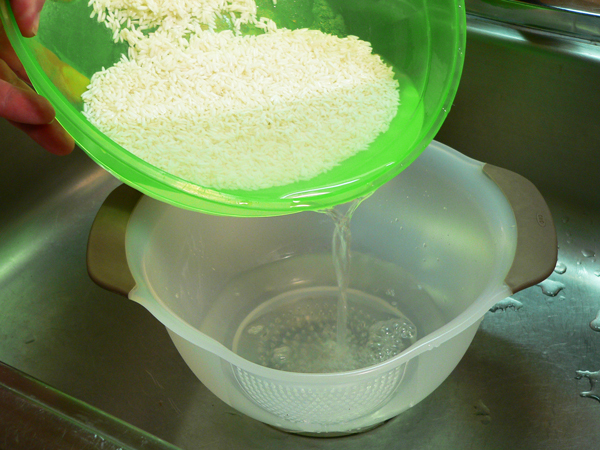 Place rice in OXO strainer, rinse well under cold running water. 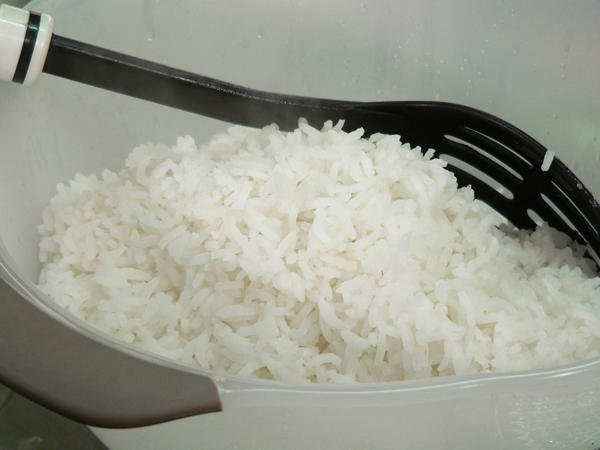 Place rice in a large bowl, cover well with cold water. 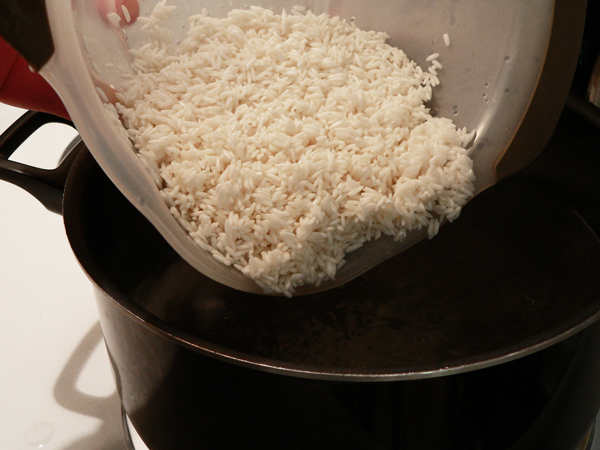 Set rice aside, let soak for 30 minutes. Pour rice into the OXO strainer and let drain. 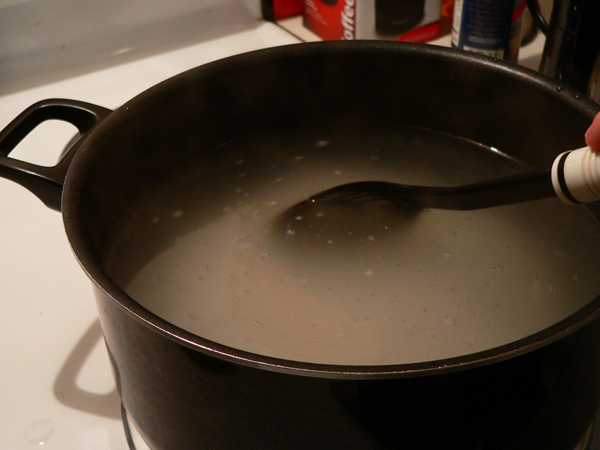 Place 8 cups cold water in a large sauce pot. Place sauce pot over Medium-High heat on stovetop. Bring water to a low boil. Bring rice to low boil, let boil for 8 minutes, stirring every three minutes or so. 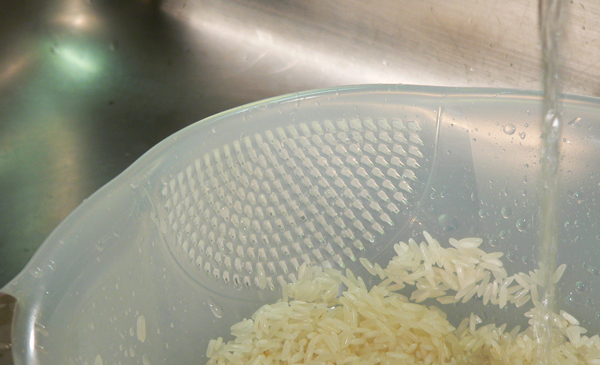 Using the OXO strainer, drain all the water from the rice. Set rice aside to cool. 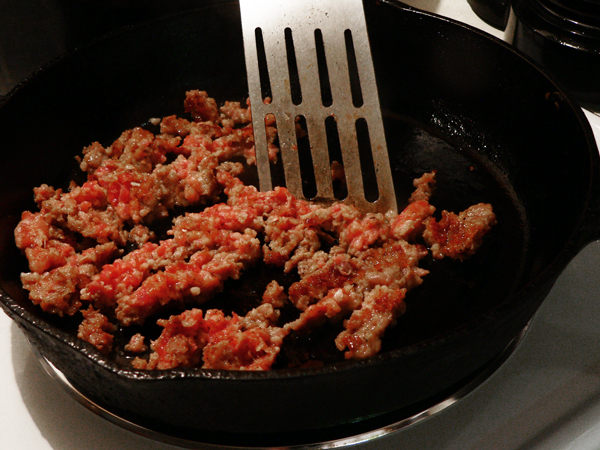 Place ground sausage in skillet, over medium heat. Cook sausage until browned. Add quartered tomatoes. Let sauté with sausage for about one minute. Prepare eggs, cooking as desired. Place one cup of cooked rice in a small bowl. Add the cooked sausage and tomatoes. Top with grated cheddar cheese. Your Comments: I’d love to hear your comments on our recipe. It will only take a minute or two for you to share your comments in the section below. Just remember, all comments are moderated. That just means that I personally read each and everyone before they are approved for viewing on our family friendly website. Thank you in advance for sharing. Sign Up For Our Free Newsletter: While you’re here, be sure to sign up for our totally FREE NEWSLETTER. I’ll send you an Email to remind you when I post a new recipe, or when anything else of importance is going on around Taste of Southern. It’s totally free, and super easy to sign up. And, should you ever decide that you are no longer interested, it’s even quicker to unsubscribe. How cool is that? I’ll be looking forward to seeing you add your name to our list. The signup box is below and you’ll also find one in the top right hand corner of each page. I hope you’ll do it today. Hi Steve,seeing those neese;s sausage made me hungry.They are not sold in my state.wish they were,I have and do get to enjoy them when I visit NC.THANKS for all the sharing of recipes,and your travels. I look forward to your emails.